3.4.1915: Launched by Cochrane & Sons Ltd, Selby (Yd.No.639) for Anchor Steam Fishing Co Ltd (64/64), Grimsby as TRIBUNE. 15.7.1915: Registered at Grimsby (Part IV) (GY563). 6.8.1915: Registered at Grimsby (Part I). 6.8.1915: William Somerville Letten designated manager. 9.1915: Requisitioned for war service as a minesweeper (1-6pdr HA, 1-7.5” A/S Howitzer) (Ad.No.1747). 5.2.1916: George Somerville Letten designated manager. 1920: Returned to owner and reverted to TRIBUNE (GY563). 12.9.1923: Sold to The Beacon Steam Fishing Co Ltd (64/64), Grimsby. 25.9.1923: Vessel mortgaged (64/64) to London Joint City & Midland Bank Ltd, London (A). 9.10.1923: William Francis Goodwin designated manager. 27.11.1923: Mortgagee re-styled Midland Bank Ltd, London. 1.10.1924: Registered at Grimsby as LORD BEACONSFIELD (GY563) (BoT Minute No.1421 dated 16.9.1924). 1927: Seasonal fishing out of Canso, Nova Scotia. 12.1.1928: Reported that when outward for Icelandic grounds, encountered severe gale in North Atlantic and swept by heavy seas smashing the wheelhouse and carried it away along with the two lifeboats. Deckhand J. Laurenson who was at the wheel was carried away with the wreckage of the wheelhouse and not seen again. Arrived Seyðisfjörður for repairs. 4.8.1928: John Denton Marsden designated manager. 31.9.1928: Sold to Consolidated Fisheries Ltd (64/64), Grimsby. 30.11.1928: Vessel mortgaged (64/64) to Midland Bank Ltd, London (B). 3.1929: Chartered to fish in Canadian waters based at Canso, Nova Scotia in a training role. 28.3.1929: Grimsby registry closed “ … transferred to the Port of Canso, Nova Scotia … “. 7.7.1930: Notification received from Registrar of Shipping, Canso that transfer of Registration has not been accepted, the owners having failed to comply with requirements of the Canadian Shipping Act. (?? Order 39039/30 dated 2.7.1930 refers). 7.7.1930: Registry re-opened at Grimsby (GY563). 18.3.1931: From Icelandic Coastguard steamer ODINN. “Trawler LORD BEACONSFIELD ashore 35 miles east of Portland (Iceland). On rocks. Weather calm and swell moderate to rather rough.” At 10.00am. crew left and safe on shore. 24.3.1931: Refloated and taken in tow for Reykjavik; four crew onboard. 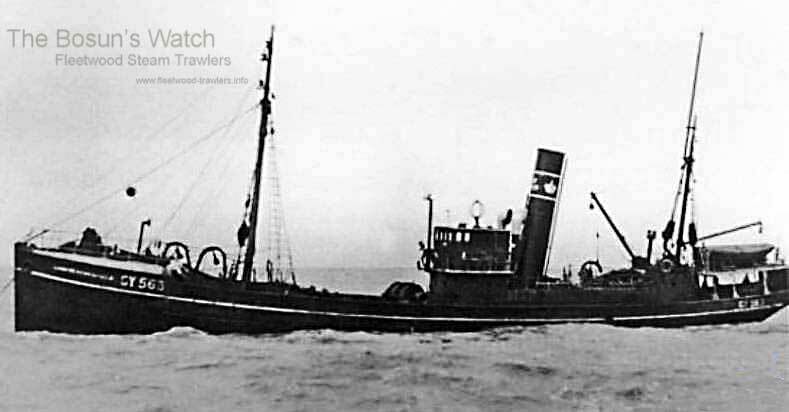 30.4.1932: Reported that outward from Grimsby for Icelandic grounds, in collision off the Scottish Coast in dense fog with Aberdeen steam trawler DEVANHA (A458); neither vessel suffered much damage. 12.9.1933: Sold to Sk. Martinus August Olesen, Grimsby and Archibald Ambrose Winter, Cleethorpes (64/64 joint owners). 14.9.1933: Martinus August Olesen designated managing owner. 28.9.1933: Vessel mortgaged (64/64) to Consolidated Fisheries Ltd, Grimsby (C). 3.4.1935: Sold to Consolidated Fisheries Ltd (64/64), Grimsby. 8.4.1935: Sir John Denton Marsden Bt designated manager. 28.8.1937: On the Icelandic grounds, deckhand A. C. Dennison (20) of Grimsby was scalded by boiling oil whilst extracting oil from cod livers. Landed at Seyðisfjörður but died in hospital. 8.1939: Requisitioned for war service as an auxiliary patrol vessel (Hire rate £83.1.0d/month). 4.9.1939: Based Grimsby on Fishery Protection duties. 4.6.1940: Converted for service a s a minesweeper (1-12pdr)(P.No.FY608). Based Ipswich with M/S & Patrol Group 79. 12.1941: Ty/Sk. Alfred Hill RNR appointed CO.
23.4.1942: Sold to J. Bennett (Wholesale) Ltd (64/64), London. 28.4.1942: Harry Markham Cook, Fleetwood designated manager. 11.8.1943: Sk. Wilfred Thompson RNR appointed CO.
6.1945: Paid off to Reserve, awaiting disposal. 16.10.1945: Returned to owner after restoration and classification at Aberdeen. Sailed Aberdeen for Icelandic grounds (Sk. Sydney Brewis, Hull); seventeen crew all told. 17.10.1945: In dense fog, stranded on rocks off Prail Castle, 1nm SW of Red Head, Auchmithe, Angus. In response to rockets and distress call, attended by Arbroath lifeboat, JOHN & WILLIAM MUDIE, Cox. William Swankie. As tide receded assumed list to port of about 45° and engine room and stoke hold flooded to a depth of 10ft. All crew taken off by lifeboat and landed at Arbroath; personal gear brought ashore in ship’s boat. 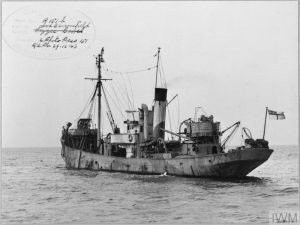 Later attended by two salvage vessels, but salvage considered impractical and vessel considered a constructive total loss (CTL). Accepted as loss by underwriters. 6.12.1945: Grimsby registry closed “Total Loss”. This entry was posted in Lost Vessels, Steam Trawlers, Steamers (Picture) on March 28, 2017 by Fred Smith.